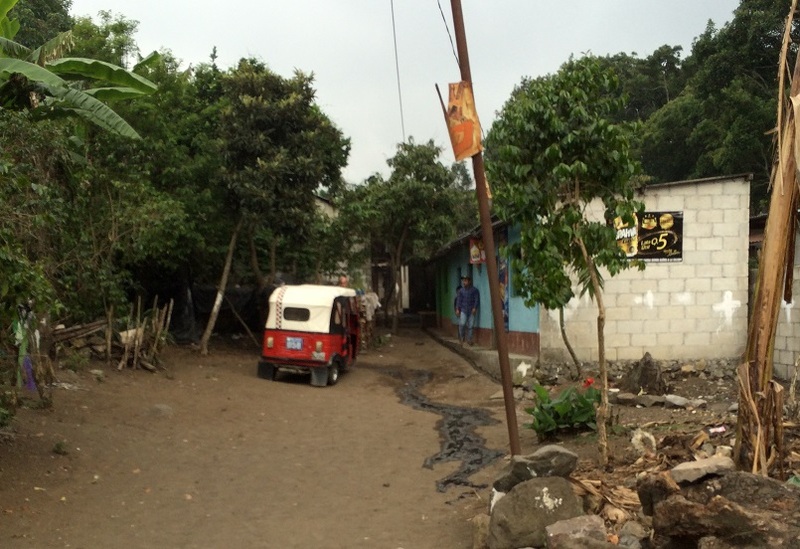 In the town of Panajachel there's a surprising amount of religious diversity. For example it's easy to find Mormon and Jehovah Witness missionaries walking the main streets in town. It's also common to see an evangelical Christian with a bullhorn and a bible walking through the market. 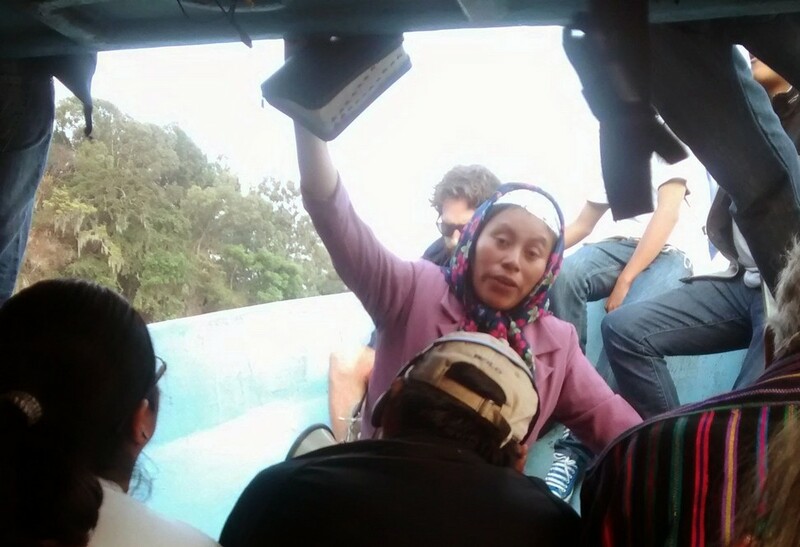 Recently I was on a boat when the woman pictured below began preaching to the passengers. While I don't know exactly what she was saying, I do know her intent was to save us from our sins (that's about all I could understand). Another passenger on the boat disagreed with her doing this on a public boat and kept telling her to be quiet and sit down. She began praying for him quite loudly. When the Spanish conquered the indigenous Guatemalans a blending of native Mayan beliefs and beliefs of the Catholic Church occurred. This can lead to some interesting combinations in religious settings. Case in point is Saint Maximon (pronounced maa-shee-MOHn), also referred to as San Simon. Sculptures of Maximon can be found commonly throughout Guatemala. He always has a cigarette and some sort of liquor bottle. We'd seen statues and depictions of this guy many times but never got the back story until recently. Stories about his origins vary, but a number of Mayans believe him to be the Saint of Vices. All stories depict him as a fellow with an affinity for women, liquor and smoking. Some say he was once a priest. Others say he was murdered by men that lived in his town after he had affairs with their wives. No one appears to know the true origin, but he is one popular dude. Several towns throughout the country have formal shrines for him. For reasons that are unclear these shrines are relocated to another section of town each year following Semana Santa (Holy Week). Santiago Atitlan, located just across the lake from Panajachel, is one of the towns that is most well known for having a shrine to Maximon. We went to Santiago last weekend and while there we asked several locals where we could find Maximon. None of them knew exactly, so we jumped in a tuk-tuk and asked the driver to take us to him. Tuk-tuk drivers always know this kind of stuff. The driver took us about a mile outside of town to a group of non-descript buildings with a dirt driveway. We jumped out and he told us Maximon was located in the second building down the path directly in front of us. We walked down the path to the second building and it was clear we were in the right place. There was music, smoke and incense pouring out of the building. The shrine is located just inside the building on the left. As we entered the shrine we were told there was an entrance fee as well as a cost to take each photo. I negotiated and paid Q15 (about $1.95) which covered our entrance fee and gave me the ability to take the following three photos. The deity Maximon and his caretakers. The caretakers pass on offerings like cigarettes and alchol (or in our case the entry fee)) to Maximon. The actual effigy has no arms or legs. Some legends claim that is because they were cut off by vengeful husbands of women he had affairs with. There was a lit cigarette in his mouth and several partially drank bottles of liquor near by the statue. On the right hand side of the room was a glass casket containing a crucified Jesus Christ adorned in flowers and Christmas lights. In the far back corner was another shrine to other Saints. An homage to other Saints in the shrine for Maximon. Apparently a lot of people come to pay homage and to pray to Maximon. We were in and out in less than 5 minutes. There's really not much to see, but we did find the blending of cultures and religion interesting.